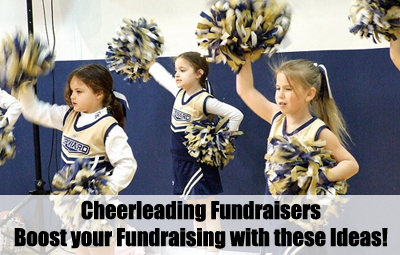 Looking for some cheerleading fundraisers to boost your Fundraising campaign? Well you're at the right place! You're going to find some AWESOME fundraising ideas here that will be super rewarding for your group! These fundraising ideas are to add to the Ideas on the main Cheerleader Fundraiser page. Be sure to read that page for some great tips and advice on Cheerleader Fundraising as well! Fundraising with Water Bottles - A simple and brilliant addition to any fundraising event. Sell custom made Water Bottles with your logo on. Also sell advertising blocks on your bottles! This is a very profitable fundraiser and can also be run as a stand-alone product! 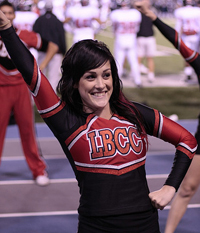 Online Cheerleader Apparel Fundraising - Selling Apparel has always been one of the most successful fundraisers. Now you can take this brilliant fundraiser online through an SSA Custom Apparel Store! I highly recommend you use this fundraiser! And also check out the T Shirt Crowdfunder. Discount Cards & Scrip - Two very similar Cheerleading fundraisers that your supporters absolutely love. Definitely check them out! Magazines - You can either do this product fundraiser offline through EFI or Online through GA Fundraising. It's a really rewarding fundraising idea! Bracelet Fundraisers - Bracelets are super cool fundraising products that will be perfect for your Cheerleader Fundraising. Think carefully about your design and incorporate your Cheer Groups colors! Walkathon - Simply put, "Pledge" based fundraisers like Walkathons, Dace-a-Thons, Spin-a-Thons, etc. hold incredible fundraising potential. Cheerleader Car Wash - The overused yet still highly successful fundraising idea. This fundraiser is all about how you set it up and how you promote it. Learn how to make it successful! Golf Tournament - A Golf Day Fundraiser is one of the most lucrative and successful fundraisers you'll use! It does take loads of organizing but it is absolutely worth it! Auctions - Any cause can use an Auction to successful fundraise with. Auctions are flexible, can fit into any event and can also be run as standalone fundraisers! A great auction option is the Silent Auction. Bowling Fundraiser - A Tenpin Bowling Fundraiser is a really fun event that will suite Cheerleaders perfectly. Get loads of participants to make profitable and consider having it as a Bowl-a-Thon, where participants take donation pledges for number of pins bowled over! You can setup your Bowl-A-Thon Pledge service with RFI's partner, DoJiggy Fundraising Software! Raffles - One of the most solid and rewarding fundraisers! Just like an Auction Fundraiser this will fit into any event but can also be used as its own fundraiser! Surveys Or Get Paid Online Guides - This online fundraiser has proven very profitable for some groups. What you do is get your team to take Online Surveys through 'Get Paid Guides' like Paid Surveys At Home! You then get paid a fee for each survey taken! Flamingo Fundraiser - This is such a creative and fun fundraising idea! It's perfect for a Cheerleading Fundraiser! But you'll have to read the page to find out how it works!!! 10 Unusual Fundraising Ideas - This is a list of 10 brilliant, but unusual ideas. It's become an extremely popular article and is definitely worth checking out! More Cheerleading Fundraising Ideas coming soon!